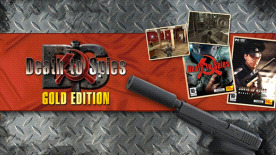 Death to Spies: Gold Edition includes Death to Spies and Death to Spies: Moment of Truth. Smersh is the Russian for Death to Spies and was the name of a set of counterintelligence departments in the Soviet Army formed during World War II. Their mission was to secure the rear of the active Red Army by arresting traitors, deserters, spies and criminal elements. During the war these agents became the main force combating the German intelligence service. The game's main character is a captain in the 4th department of the Soviet counterintelligence service. He is a professional spy trained to execute dangerous operations on his own. During missions he will have to complete various tasks in the heart of enemy territory including stealing important documents, eliminating different enemy officers or high-ranking officials, kidnapping and sabotage. Game missions are based on real historical events and operations which were executed by the military intelligence and counterintelligence during the war. Moment of Truth is a sequel to the popular stealth action title Death to Spies. The game's main character is Semion Strogov, a captain in the 4th department of the Soviet counterintelligence service called SMERSH. SMERSH literally means in Russian, Death to Spies, which was the name for a set of counterintelligence departments in the Soviet Army formed during World War II. Strogov is back from his previous missions and must now participate in a series of even more complicated and exciting military operations under the code name "Death to Spies: Moment of Truth". The hero possesses all the skills required to accomplish especially dangerous missions including, getting information about the disposition of hostile military and civil units, assassination of enemy agents and representatives of Wehrmacht’s high-ranking officers and espionage. By the order of his supreme commander Strogov, who passed through a serious retraining, will have to accomplish various top secret missions. His task is to capture spies, saboteurs and gather information about their actions using unique technologies and devices.